You may agree that transportation apps we have today are successful in reaching out to their target market. How can SMEs and other businesses learn from those apps’ strategies? I’ve noticed a growing number of transportation apps. Many of them are start-ups or have recently joined the Philippine market, yet they seem very successful. My business, on the other hand, has been around for years, and is nowhere near as successful or as recognized as these applications. What am I doing wrong? What should I be taking from these applications on how to run a business? They seem to have the know-how. Any insights on the matter will greatly help! There are a growing number of transportation apps in the market, and it is rapidly increasing due to the demand of users to find ways to address traffic concerns and public transportation safety. There is a development, and even success, for these applications because developers are aware about what needs to be resolved, and thus, align their applications to try and solve those concerns. One thing that makes the popular transportation apps successful, is that they are user-centered. They direct their services to a certain market, then develop it to solving that market’s concerns. Take Sakay.Ph for example. It targets the commuting community here in Metro Manila. Using a similar method to Google Maps’ system, Sakay.Ph targets commuters by recommending options that get them from Point A to Point B, then giving them information about the cost of fare, travel time, and where to catch a ride for each mode of transportation. What has made this app a veritable force is its multi-platform application that allows commuters to use their program not just through their smartphones, but also from their computers. They’re even working on a platform to make their services available through SNS texting. Another example is local ride-sharing app Tripid (a combination of Trip and Tipid), which uses a carpooling system that caters to both the commuting and the driving public. Through their platform, Tripid allows its users to either sell out their vehicle’s free seats to or buy a free seat from people passing by or headed in the same direction. Not only is the app providing transportation alternatives aside from public transportation, it’s also encouraging the idea of: one – carpooling to save on money, and two – carpooling to lessen the number of vehicles on the road. Their success relies on the fact that they answer user-specific needs that are generally not understood by bigger developers that do not know or understand the Philippine market. A great characteristic of transportation apps is their simplicity, and how this simplicity underpromises but overdelivers its services. The success of these apps lie in the fact that they don’t overcomplicate the system; they work with the system and improve on it. One great example is GrabTaxi, which partnered with already-existing taxi corporations to solve the problems of drivers and commuters alike. 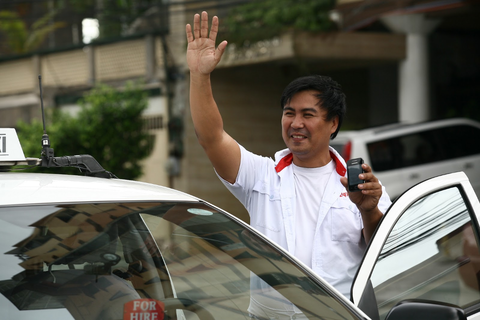 GrabTaxi’s platform worked as a bridge between taxis looking for passengers, and passengers looking for taxis, rather than creating an entirely new system that pit existing taxis against GrabTaxi-only vehicles. In as much as GrabTaxi serves as a platform between taxis and passengers, Uber on the other hand, works as a premium service that serves as a bridge between private vehicles and passengers. Targeting the market for people who prefer the safety and comfort of a privately-rented vehicle, Uber created a no-hassle platform that allows its users to directly book a private car while arranging for payments to be made through credit cards. Their successes rely on the fact that their apps are easy-to-use, trustworthy, and reliable, delivering an exemplary service that keeps users coming back. They partner with the right people. Having the right “partners” is part of making any business, or in this case – app, successful. Traffic and navigation app Waze used its partners, its crowd-sourcing community, to continuously fill and update its database of road conditions. Thus the success of the app lies in the fact that whenever a user turns on their application, they are contributing data to Waze, as well as using data that other Wazers on the road are supplying. Waze’s partners are its community of users, those who continually make use of their platform because it is not just updated, it has become relevant. An early introduction to Metro Manila roads was the MMDA Traffic Navigator App, which partnered with online news portal InterAskyon to create a platform that updates people of the traffic conditions along major road highways. The app has since expanded its coverage to include more major thoroughfares, and it remains as one of the highest downloaded navigation applications in the Philippines. Restaurant search-and-discovery app Zomato recently partnered with Uber to give users an alternative to getting to their desired restaurant destinations. Using the Zomato app, users are able to see the estimated pickup time, fare and travel time to a restaurant, and book a car directly from the Zomato app. Uber now enjoys not just a partnership with Zomato itself, but indirectly a partnership with all other restaurants in the app’s database, which increases customer traffic for both the restaurant and them. Going back to your earlier question, remember that success is not defined by the number of years of experience your business has been open, but in your relevance to your customers and consumers. Your problem might lie not in what you’re doing wrong, but what you need to improve on.